The richness and variety of the flora and vegetation of the Adamello Brenta Natural Park are unparalleled in the entire Alpine arc. 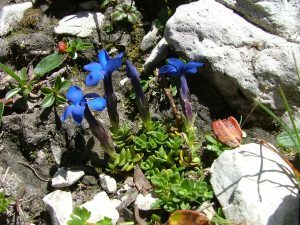 The presence of two distinct sectors with different geological features (the calcareous-sedimentary rocks of the Brenta Group and the crystalline intrusive rocks of the Adamello-Presanella) has favored the natural development of endemisms and characteristic plants. The entire green landscape of the Park is a source of profound naturalistic interest and of great visual appeal. From the valley floor and the mountain slopes covered by vast forests, to the alpine meadows at high altitude. About a third of the Park’s surface is covered by woods, which in the lower range are mostly deciduous. For example the maple, the cornelian, the rowan, the hazel, the willow, the hornbeams, the downy oak, the flowering ash. In the mountain there are beech-woods and mixed deciduous and coniferous woods. The latter are often prevalent because they were favored by silviculture in the past. Where this did not happen, the pure beech forest could develop freely (Val Daone, Val Genova and Giudicarie esteriori). Higher up the conifers cover it all: the spruce, the larch and the pine. They occupy the largest forest area of the Park and reach an altitude of 1900-2000 m. The spruce wood is interspersed with the pastures and grazes of the malghe. The summit of the arboreal vegetation consists of larch and pine. The larch is a pioneer plant, in fact it settles first on the high altitude surfaces abandoned by the pasture. The Swiss pine occupies smaller areas of woodland in the Park areas with a more continental climate (Val di Fumo and the area of the Malghette lake). The expanses of mugo pine and green alder appear immediately above the pastures, but they also colonize the debris slopes. Above the tree line, where the trees become sparse, there are shrubs like the dwarf juniper and the rhododendron. Going up here are the dwarf shrubs such as the azalea of the Alps, the alpine camedrio, the creeping willows. All examples of admirable adaptation to the particular conditions and the rigid climate of the high altitudes. These species, in fact, are characterized by reduction of the aerial parts and an increase in the root systems. Finally, here are the alpine meadows, consisting exclusively of herbaceous plants. 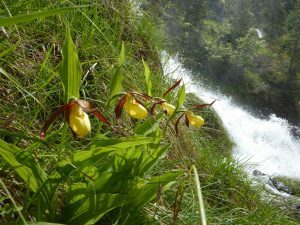 The extraordinary variety of the flora of the Adamello Brenta Natural Park is due to the morphological, geological and microclimatic differences of the territory. These determine the formation of unique environments and micro-environments, which can host different plant species. In fact each plant species has very specific needs, and survives only in suitable conditions. The current florist heritage is also the result of a series of ecosystems established over millennia between plants, the surrounding environment and the modifications due to natural causes or induced by man. in the Park, as in general on the Alps, there are numerous species that survived the glaciations. They are real “glacial relicts” which took refuge in the ice-free points and remained confined to small isolated areas, usually at higher altitudes. 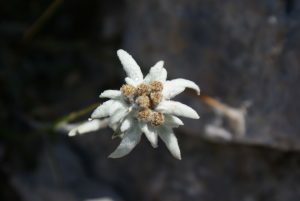 Classic examples are the edelweiss and the boreal linnea.